The seats of the Jane Mallet Theatre of the St. Lawrence Centre for the Arts were practically full; an amazing turn-out for a Sunday matinee. Attendees talked with hushed excitement as the orchestra tuned their instruments, preparing for the lights to dim. Within moments, I would be treated to the final showing of Isis and Osiris: Gods of Egypt. The premiere of the new Canadian opera and finale of Voicebox: Opera in Concert‘s season. 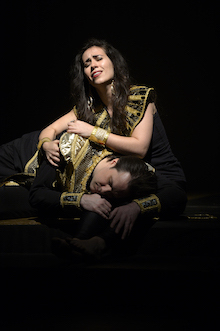 Isis and Osiris was created by librettist Sharon Singer and composer Peter-Anthony Togni. The opera is a grand love story inspired by ancient Egyptian mythology. Singer and Togni had the difficult task of condensing an entire mythos into a palatable two acts. The story focuses on the four children of the god of the earth, Geb, and the goddess of the sky, Nut: Isis, Osiris, Seth, and Nepthys. Osiris and Isis rule over the land of Egypt as king and queen, husband and wife. Osiris and Isis are bound by their rule, as well as their devotion and eternal love for each other. Seth and Nepthys are also married, but Seth is not pleased with his fate. As the leader of the armies of Egypt, he longs for more power and destruction than Osiris allows. Seth intends to usurp Osiris from his role as king, and from his role as Isis’ husband. After Osiris declares peace throughout Egypt at royal jubilee, Seth begins his plot against his brother. The major challenge with a show about ancient Egypt is that the average person has little knowledge of the culture. Even an expert on the ancient world can only guess what the music sounded like and how its people acted. We only have a vague impression of what ancient Egypt is like. Guillermo Silva-Marin, who acted as general director, dramatic advisor, and lighting designer, took on the challenge to strengthen that impression. Silva-Marin conjured the atmosphere of the ancient Egypt we can imagine. What I picture is a place that was grand, glorious, and mystical. Isis and Osiris made that vision a reality through costume, music, and song. The orchestra, lead by conductor and chorus director Robert Cooper, C.M., swept me through the scenes. The orchestra lifted me into the heightened reality of the mythological story. The cast and chorus were decked in costumes of black and shimmering gold. The abundance of gold made the stage glisten with luxury. Watching the singers move around the stage, I felt like the two hues were sending the important message that nothing was plain in the world of Isis and Osiris. Love was not plain. Government was not plain. The entirety of Egypt was not plain. In this world, there is either darkness or shining gold. The stars shone just as brightly on stage. Tenor Michael Barrett as Osiris commanded attention with his rich voice. Listening to soprano Lucia Cesaroni as Isis was an experience in itself. Her voice was so beautiful at times it sounded supernatural. Cesaroni fully encompassed the power and magic of a goddess. Barrett and Cesaroni harmonized well in song, and impressed with their acting. Although opera is not known for ‘subtlety’, the subtle movements between Barrett and Cesaroni convinced me of their characters’ devotion. I saw it in the way they looked at each other across the stage or how Cesaroni cradled Barrett’s head in her lap. Isis and Osiris sang great declarations of love, but their subtle intimacies were as loud as their songs. Mezzo-soprano Julie Nesrallah as Nepthys had a clear and powerful voice. Baritone Michael Nyby as Seth was an absolute standout. Nyby embraced the role of antagonist. His deep voice was filled with foreboding, even before the plot against Osiris began. Every step he took looked like a challenge and every line had bite. His portrayal embodied all aspects of destruction and spite. He was the very definition of ‘villain’. Unfortunately, the production of Isis and Osiris was the last of Voicebox’s season. On a more positive note, it means that opera fans have time to plan for their upcoming season: “Shakespeare 400” on October 30th; “I Capuleti E I Montecchi” on November 20th; “L’Isola disabitata” on February 5th, 2017; and “Khovanshchina” on March 26th, 2017. The performances for next season can be found on their website. If Isis and Osiris is any indicator, they will be worth watching.